The complex Class Brilliants are slightly more shrill than expected, but the brightness may be a plus for many. Sweet, shrill tone that could cut through heavier sounds. Bright, modern vibe. May prove a little too shrill for some tastes. 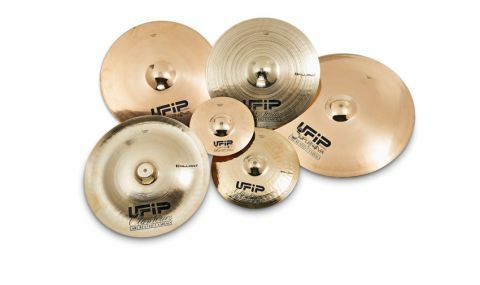 Italian firm UFIP's Class series has long been its pro all-round cymbals, available in High, Medium and Low pitches/weights. The Class Brilliants are lighter-weight cymbals which undergo an extra high temperature buffing and polishing. This adds tension while partially smoothing down the lathed grooves, resulting in a molten gold look. Class Brilliants are made via UFIP's unique Roto-casting process which uses centrifugal force (rotation at 1,000 rpm) to spin out impurities. The result is a super-pure B20 alloy which, claims UFIP, increases durability. Cymbalise says the extra high temperature buffing of the Class Brilliants imparts a brighter, quicker sound than the standard Class equivalent. We certainly found that. We were slightly taken aback when we gigged with a set and found they were exceptionally penetrating and rather toppy. Starting with the 21" ride, it had a commanding breadth but also a shrillness which was awkward on more subtle tunes. Though for more aggressive rock or even metal, this could prove a real advantage. "The tone is sweet, but there's a biting edge"
The same applies with the three crashes, which were complex, but still urgent and sharp. The 17" worked best, with the crystalline tone associated with UFIP - smooth yet not one-dimensional. With the 16" and 18" we got more of the shrill attacking component which then gives way to a duskier, warmer spread. All three have an even tail-off and decent sustain. The 10" splash benefits from the brilliance helping it speak more distinctly. As a quality cymbal the tone is sweet, but there's that biting edge again which makes this an excellent splash. The edgy quality is also a feature of the 13" hats. With two holes in the bottom cymbal aiding air escape the 'chip' sound is crisp and taut, while the closed stick sound is louder and more precise than with the Supernovas. The 18" china has a hard dinging ride sound and more obviously trashy tone when you strike the edge. It is more loud and vivid than dark and mysterious, a cymbal you need to be careful with or it will dominate.